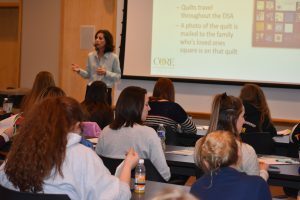 The Center for Organ Recovery & Education (CORE) assists secondary students in Pennsylvania and West Virginia with pre-thinking the critical issues surrounding organ and tissue donation so that each teen can make an informed decision, and communicate that decision to his or her family members. Let one of our trained Advocates dispel the myths and misconceptions surrounding organ donation, explain the organ donation process, and share his/her personal connection to donation to your class. Additionally, we are excited to offer students the opportunity to visit CORE for a day of learning at one of our CORE High School Student Camps. Please don’t miss the chance to give your students a life-changing experience! To discuss these opportunities or for more information, please contact Francesca Ferrante at fferrante@core.org.